How long have you worked at Wente Vineyards? I started in 1999. • • • What are your primary responsi- bilities? Today, I manage the Estate Tasting Room and The Winemakers Studio, along with all our diverse Club and wine tasting experiences, including The Winemakers Studio, the Nth Degree Club Lounge, and the many events held on property. • • • What uniquely qualifies you for your job? As a key member of the Wente Tasting Room production team I have, over the years, been responsi- ble for creating and customizing wine experiences and gift wine or- ders, managing group tour logistics, and later became a front-line member of our hospitality team. • • • How would you describe the venue to someone who has never visited the property? You will be standing on the original estate area of the oldest continuously operated family-owned winery in America. This property is also a registered Cal- ifornia landmark. You can enjoy pre- mier wine tasting, as well as have hands-on wine experiences. We have tours of wine operations, which in- clude our Small Lot wines, and tast- ing and educational experiences in The Winemakers Studio. The grounds are lovely and open for your personal enjoyment. Our various Wine Club members have access to a comfort- able lounge with tableside service. • • • What would you most like visi- tors to know about the Estate Win- ery & Tasting Room? Here at the Estate Tasting Room we are located on the original 47 acres acquired by Carl H. Wente in 1883. On this prop- erty, you can enjoy tours and tastings of our estate wines and our Small Lot wines specially handcrafted by Fifth Generation Winemaker Karl Wente. If you want to learn more about blending wines, tasting technics, pair- ing wines with food and much more, you have access to The Winemakers Studio here on the same property. • • • What is your favorite Wente Vineyards wine and why? With meals of beef or pork, I like Nth De- gree Cabernet Sauvignon, Nth De- gree Merlot, or Charles Wetmore Cabernet Sauvignon. All of these are excellent red wines. If eating some- thing a little lighter, like fish or chicken, I like Nth Degree Chardon- nay or Riva Ranch Chardonnay. • • • How would you describe your- self in wine terms? I was aged for just the right amount of time result- ing in well-balanced acids and tan- nins, a body like whole milk, and rich in active character with a long smooth lingering finish. • • • What do you like to do when you're not working? I love to spend time with my family. They are very special to me. We try to make trips to Mexico to visit more of our family whenever possible. 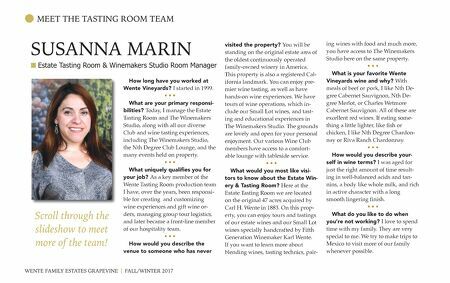 SUSANNA MARIN n Estate Tasting Room & Winemakers Studio Room Manager WENTE FAMILY ESTATES GRAPEVINE x FALL/WINTER 2017 l MEET THE TASTING ROOM TEAM Scroll through the slideshow to meet more of the team!